Today is Sweet Potato Day, dedicated to increasing awareness about world hunger. It's the brainchild of ONE, a movement that's all about fighting extreme poverty (yep, Bono co-founded it). 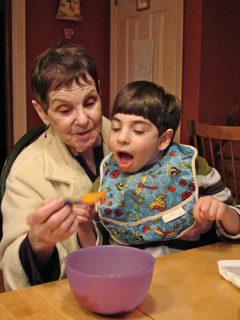 I had to join in, given the cause and Max's devotion to sweet potatoes; that's my mom feeding Max, circa age 6. It may seem like a humble potato, but it has the power to save lives. Every year, 3.5 million children die from poor nutrition. Right now, there are an estimated 25 million chronically malnourished children around the world. Investing in agriculture is one of the best ways to fight poverty and malnutrition—which is where the sweet potato comes in. Sweet potatoes are easy to grow. They pack a lot of Vitamin A, which promotes growth and development and healthy skin, eyes and immune responses. And they're tasty, too. I was happy to give Max plenty of them when he was a baby, because he needed all the vitamin boosts he could get. At one check-up, the pediatrician questioned whether Max liked sweet potatoes. I asked how he could tell. "His skin has an orange tint," he noted. I was tempted to tell him it was self-tanner. As it became clear that the cerebral palsy was causing issues with chewing, mashed sweet potatoes were a blessing, easy for Max to munch on. I'd drizzle in a teaspoon of Omega-3 oil (said to help with brain development), and mix in a load of butter to make sure he was getting enough calories. To this day, sweet potatoes are one of Max's favorite foods. Last Thanksgiving, I decided I was going to make the most decadent sweet potato pie for him. I am not good at concocting my own recipes, but I excel at asking for suggestions—and I got a ton of great ones from Facebook friends. I settled on this sweet potato pie from All Recipes. I can't tell you exactly why I went with it, it just seemed simply good. I made two. Max ate the better part of one. My family is still talking about the pie. My husband is sad that nobody remembered the turkey he cooked. So consider the mighty sweet potato: A staple on our tables, yes, but also a spud that can sustain children's lives. Enjoy the recipes below from bloggers far more cook-tastic than I am. And please, take twenty seconds to sign this petition asking world leaders to make serious commitments to reducing chronic malnutrition for children around the world. Did you know that there are naturally PURPLE sweet potatoes? They're not widely available --I get them at a big Korean supermarket in Edison, NJ--but wouldn't they be a hit? They have a regular-colored beige skin, but inside they're a true deep bluish purple, whether raw or cooked--but otherwise they behave just like the standard orange ones, if a bit smaller. And they're very sweet. They're mostly limited to Asian markets, but take a look at Stokes Purple Sweet Potato at Amazon. Imagine using them in a pie! Yes!!! I keep meaning to get them. Thank you for that reminder! Signed. Thanks for sharing this. ellen, love your post. love max's history with the sweet potato and that it was such a blessing for him! so neat. anyway, love your post and excited to a part of this with you! Amd thank YOU, Jane and Jeannine, for this amazing effort to call attention to a truly simple solution that could help all those kids in need. Love how you made the association with Max and the sweet potato and ONE's mission-- a reminder that the world is all so interconnected! Thanks for sharing Ellen. We love sweet potatoe too ( coop insists baked topped with caviar and sour cream) will get onto the petition now! There is a sweet potato or yam recipe that I found by accident years ago. My dh and my kids adore it! It's called Vegan Yams and it's the bomb. Sans those nasty marshmallows people insist on putting on sweet potato dishes. Here it is: http://kitchen-parade-veggieventure.blogspot.com/2007/11/fresh-candied-yams.html Try it, you'll love it as much as we do. My husband says that the sweet potato taste really shine through here. I like marshmallows on my sweet potatoes. I also like sweet potato fries.